The IAATI Award of Merit was created in 1992 to honor a person, group, department or company for outstanding contribution in the area of vehicle theft investigation or prevention. Analyst Gina Jeffries – Colorado State Patrol (ATTIC) - Bow Tie Crew Inv. Deputy Random Pihlak - Weld County Sheriff Office - Bow Tie Crew Inv. Det William H Johnson – Arvada Police Dept - Bow Tie Crew Inv. Det Jennifer King-Sullivan – Broomfield Police Dept - Bow Tie Crew Inv. Inv Dana Chavez - Colorado Attorney General’s Office - Bow Tie Crew Inv. In October 2014, the Bedford (TX) Police Department contacted the Task Force after patrol officers interrupted an in-progress theft of a Harley Davidson motorcycle in an apartment complex. One suspect was arrested by officers and several others fled the scene, taking the motorcycle with them. Due to the Task Force’s expertise in auto crime investigations, Bedford PD requested that the Task Force adopt the case and take over the interview and investigation. This patrol-initiated arrest ultimately led investigators to uncover a sophisticated motorcycle theft ring that was linked to members of a prominent outlaw motorcycle gang. The investigation would span two states (Texas and California) and two countries (Unites States and New Zealand). This request was one of 2,514 agency assists rendered by the Task Force in 2014, and arguably the most significant in recent years. Det. Kipker and Agent Keener determined that the Bedford arrestee was a paid lookout for the primary suspect, who was an active enlisted member of the U.S. Army and a confirmed member of the outlaw motorcycle gang. The suspect and other club members were already the subjects of an unrelated Aggravated Assault offense in Bell County, TX from 2012 where they were involved in a deadly shooting incident. Kipker and Keener determined that the main modus operandi of the suspect and club members was to locate Harley Davidson motorcycles, pick the ignition cylinder with a custom lock-pick set, defeat the electronic ignition system and drive the stolen motorcycle to an awaiting enclosed cargo trailer that had been parked in close proximity to the offense location. The suspect would then transport the stolen motorcycles to either a staging location in Temple, TX or to a motorcycle shop in the Dallas-Ft. Worth area. Surveillance video captured on a Walmart security camera provided investigators with evidence corroborating the arrestee’s information and provided a suspect vehicle and trailer description for investigators. An investigator with the Heart of Texas Auto Theft Task Force (Waco) was requested to surveil the suspect’s known address in Temple, TX, where the investigator located and matched the suspected vehicle and trailer used in the thefts. Investigators began an exhaustive search across the State of Texas for similar offenses. Several agencies responded with matching offenses, in particular, an offense in Grand Prairie, TX from June 2014 that included video the suspect’s vehicle and trailer being used in the offense. Det. Kipker also located several insurance claims made by the suspect involving the same vehicle used to travel the state and steal motorcycles. Det. Kipker secured photos from insurance claim files, one of which included a picture of the suspect vehicle and the suspect’s trailer captured in the reflection of the vehicle’s rear window attached to the car. Armed with the corroborating evidence, Det. Kipker and Agent Keener secured a search warrant for the suspect’s cellular provider’s data as well as a court order authorizing the installation of a GPS tracking device on the suspect’s vehicle in November 2014. When live tracker data indicated that the suspect was headed from his residence in Temple toward Dallas, Task Force investigators conducted an intercept and surveillance operation, ultimately leading investigators to the business of a Harley Davidson internet sales dealer in Richardson, TX. Investigators then coordinated a “soft stop” with a Texas DPS trooper on the suspect’s return trip to Temple, where he was identified and released with a freshly painted Harley Davidson in-tow. Over the course of the next several months and after securing information from phone records, internet sales searches, GPS tracking, pole-camera monitoring and mobile surveillance operations, Kipker and Keener identified 17 additional theft offenses. They also identified two Dallas County businesses involved in the “chopping,” VIN-swapping, sales and shipping of the stolen motorcycles. Investigators also identified a storage unit in Temple that had been used by the suspect to conceal stolen motorcycles. In an intelligence-sharing meeting with US Army CID and after noticing a decline in Harley thefts and activity, investigators learned that the suspect was deployed overseas from December 2014 until September 2015. Although the suspect was out of the country, Kipker and Keener continued their investigative efforts and located two Harley motorcycles that were set for export through the port in Long Beach, CA by one of the two involved suspect businesses. Investigators made contact with U.S. Customs and Border Protection (CBP) in February 2015 requesting the shipping container be located and detained. An inspection of the motorcycles in the container determined they had parts from stolen Harley motorcycles from Crockett and Garland, TX attached to them. With the assistance of CBP investigators, it was determined that four motorcycles had already been shipped internationally to New Zealand. Using international contacts, Kipker coordinated with New Zealand Auto Theft investigators who confirmed that three of the four motorcycles were registered in their jurisdiction. One of the motorcycles inspected by New Zealand investigators was confirmed to have stolen motorcycles parts attached that were from bikes reported out of Dallas-Fort Worth. In June 2015, Kipker and Keener coordinated administrative business inspections at the two Dallas County locations linked to the theft ring through their investigation. 23 officers and investigators from various agencies assisted with the large-scale operation. 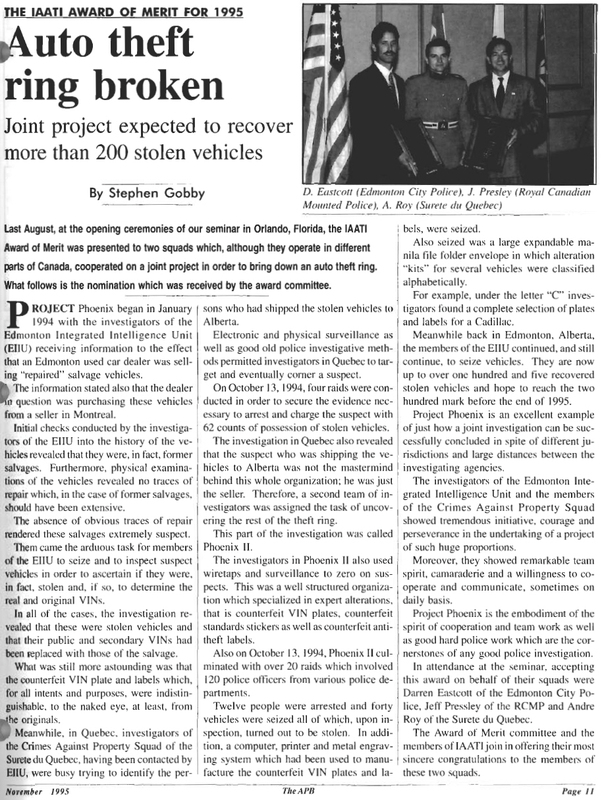 Within five minutes of entering the first location, investigators located multiple altered frames, stolen component parts and identified the method in which they were swapping VINs. Agent Keener froze the scene and secured a search warrant before seizing scores of stolen/altered parts. Two suspects, Jordanian nationals, were interviewed and arrested. At the second location, investigators located parts to an additional seven stolen Harley Davidson bikes, frames with the VINs cut out and seized several component parts with obliterated identification numbers. In December 2015, three months after the suspect returned from deployment, the Temple (TX) Police Department responded to the suspect’s residence at the request of Austin PD who was tracking a stolen 2016 Harley Davidson from their city. Kipker and Keener were notified and immediately responded to Temple from Fort Worth where they assisted with the execution of a search warrant at the residence. Investigators located component parts and documentation associated with six stolen Harleys. Two complete motorcycles, both stolen, were also located by investigators and recovered. Also seized, was the custom lock-pick/ Harley theft kit used by the suspect to steal the motorcycles. The suspect was arrested for the theft of the Austin bike and jailed. It was later determined by Temple PD that the suspect was possibly related to 30 additional violent crime offenses that had occurred in the Temple/Killeen area over the past several years. Kipker and Keener presented their Harley Davidson theft ring case and investigation details to an assistant U.S. District Attorney from the Western District in Waco, TX. In February 2016, after receiving cooperation from the Jordanian nationals, the suspect and an additional gang member were indicted on federal charges for Conspiracy to Maintain a Chop Shop and warrants were issued. The suspect, who was out on bond for the Austin motorcycle theft, was arrested by U.S. Marshal’s and is awaiting trial. Several other individuals are currently being investigated and the Task Force is expecting a second and possibly third round of federal indictments on additional suspects in the near future. To date, investigators have located parts and/or complete motorcycles related to more than 40 thefts in Texas. Det. Kipker and Agent Keener have truly demonstrated an extraordinary amount of investigative skill and coordination while spearheading this criminal conspiracy case. Det. Kipker, working closely with the Harley headquarters in Milwaukee and local shop personnel throughout the course of the investigation, has developed into a subject matter expert in Harley Davidson identification. He was recently requested to share his knowledge to law enforcement personnel and to provide a case synopsis regarding this investigation and the lessons learned. Kipker and Keener managed to coordinate an investigation that required the participation of officers and investigators from all levels of government as well as internationally. They employed a myriad of surveillance types, from electronic to human tracking at various stages throughout the investigation. The amount and depth of record searches in law enforcement databases, on internet sites and through social media was unmatched. This case, and their collective effort, epitomizes every good quality that an auto theft investigator should embody. It is my pleasure to nominate these two investigators for the IAATI Award of Merit and my hope that they are rewarded for their dedication and contribution to the profession. Their receiving the Award of Merit is the result of exemplary investigative skills and determination over the past year and a half involving a motorcycle theft ring operated by members of an organized criminal street gang with international ties. Det. Kipker and Agent Keener are assigned to the Tarrant Regional Auto Crimes Task Force (“Task Force”) in Fort Worth, Texas, one of the 26 grant-funded Task Forces in the State of Texas charged with investigating auto crimes. The Task Force’s program area covers seven counties in North Texas serving approximately 2.1 million citizens and is administered under the umbrella of the Tarrant County Sheriff’s Office. The investigators assigned to the Task Force represent 10 agencies from the local, county and state level, and is led by Commander Bryan Sudan. Catherine Horton (Queensland Police, Australia) 2015 Award of Merit winner pictured with Australasian Branch President, John Hambridge. Operation Kilo Zurich focused on suspected vehicle re-birthing and drug trafficking syndicates operating in the Gold Coast Districts of Queensland, Australia. The investigation extended across Australia with the South East Queensland Police, New South Wales Police, the Victoria Police, The Crime and Corruption Commission, The Australian Federal Police and the New Zealand Department of Transportation joining in. An employee of the Queensland Department of Transport and Main Roads was caught legitimizing stolen vehicles with new registrations. Ultimately 12 people were charged with 106 vehicle related offences and 28 vehicles were recovered worth a value of $1,300,000. An additional $14,888,000 in stolen property was recovered and $10,071,450 in criminal assets and proceeds were seized. A drug trafficking syndicate was also identified and targeted. This included 36 persons charged with 138 offences. The Queensland Police Service performed an outstanding job of bringing a multi-jurisdictional investigation to a successful conclusion. Without the cooperation of all of these agencies, the suppression of these criminal syndicates would not have been possible. Det Senior Constable Catherine Horton was one of the principal investigators for Operation Kilo Zurich. California Highway Patrol Vehicle Theft Investigators Jim Eberhart, Tony Padilla, Robert Holtz, and J. Vaughan commenced an undercover mobile storefront operation dubbed “Operation Wheel Spin.” This operation was led by the four CHP investigators assigned to the California Highway Patrol, Southern Division Investigative Services Unit (ISU). The operation was spearheaded by the investigators as an innovative and modernized method of investigating vehicle theft activity. The purpose of the operation was to identify career vehicle/motorcycle thieves, theft rings, chop shops, recover stolen property, and to gather the evidence necessary for arrests and successful prosecution of those suspects involved. The overall goal of the operation was to reduce the vehicle/motorcycle theft rates in Los Angeles County and surrounding communities. California leads all other states in the US in motorcycle thefts over the last five years (Source: National Insurance Crime Bureau, 2012 Motorcycle Theft and Recovery Report). Operation Wheel Spin began with the purchase of outstanding stolen sport bike motorcycles by utilization of confidential resources. Undercover officers were then introduced into the case and began to buy stolen property from suspects. In the months that followed, CHP investigators began to conduct a series of undercover buy/walk operations of stolen motorcycles while maintaining covert status during the investigation. Multiple investigative tools and resources were utilized, including undercover operatives with full undercover identities (names, phone numbers, e-mail accounts, social media internet accounts, misc. props, etc. ), undercover vehicles, body wire monitoring, audio/ video recording devices, covert cameras, use of ground/aerial surveillances, and cold/wall stops to identify suspects and co-conspirators. Investigators assigned to the undercover operation conducted a multitude of tasks including, maintaining/organizing the operation in a systematic manner for all inquiries and reporting procedures; maintaining multiple logs consisting of the undercover transactions, intelligence meetings, suspects, evidence, recoveries, undercover activities, notes, statistics, operational and tactical briefings with team members and supervisors on the progression and direction of the operation; planning and conducting undercover operations; status updates with District Attorney/Attorney General; search warrant authorizations; and report preparation which culminated case filings. Operation Wheel Spin came to an end in December 2013. California State Deputy Attorney General Natasha Howard, who had been working with CHP Investigators, was presented with the case filing in January/February 2013. Since the filing, multiple arrest and search warrants were served, chop shops were identified and eliminated, and dozens of additional stolen motorcycles were recovered. The prosecution of the suspects identified through the undercover operation is currently on-going and many have resulted in convictions thus far. Investigator Eberhart receiving Award of Merit from committee member Bill Skinner and President Peter Perrien at the IAATI Annual Seminar. 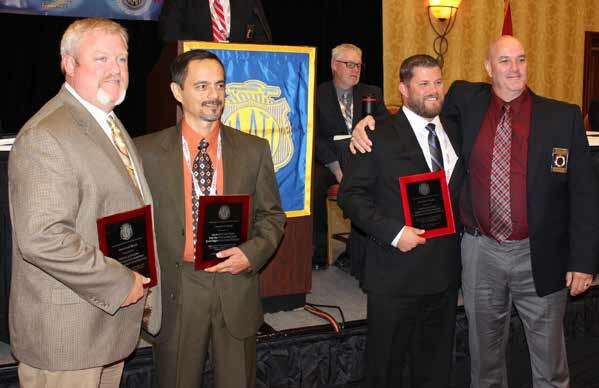 The 2013 IAATI’s Award of Merit was won by a team of investigators who participated in Operation Venetian Blinds. This case began in August of 2007 with the purchase of a 2002 Toyota Camry for $10,200. using a counterfeit Farmer’s (spelled Framer’s) Insurance check in Arvada Colorado. The crime spree quickly spread whereby the suspects purchased vehicles advertised for sale on Craigslist, using counterfeit checks with the names of various insurance companies and credit unions, usually right at or just over blue book value. The vehicles were immediately put back on Craigslist for under-retail prices and sold almost immediately to unsuspecting buyers. In November of 2007 in Overland Park Kansas, authorities came in contact with the suspects after motel staff reported that the room that the suspects were staying in contained Trac 2-way phones, wigs, latex gloves, currency, large amounts of clothing and laptop computers. In December of 2007 in Salt Lake City Utah, authorities came in contact with one of the suspects as she attempted to sell a stolen 2000 Toyota 4 Runner in an undercover sting operation. Investigators were able to confirm that over the next 3 years, the suspects were responsible for the fraudulent purchase and sale of 20 vehicles using the same methodology. The suspects were linked to thefts in Colorado, Idaho, Kansas, Missouri, Nebraska, Oregon and Utah. When all was said and done, the primary suspect, Othello Bland was sentenced to 12 years in the Kansas Department of Corrections for Motor Vehicle Theft, 4 years in the Colorado Department of Corrections for Motor Vehicle Theft out of Jefferson County and 14 years in the Colorado Department of Corrections for violation of the Colorado Organized Crime Control Act out of Arapahoe County. Jodi Reed was found guilty in Salt Lake City for attempting to sell the stolen Toyota 4 Runner to undercover officers and Chelsea Getchell (Jaros) was found guilty in Overland Park Kansas for her involvement with a stolen Dodge 1500 pickup. The IAATI Award of Merit was created in 1992 to honor a person, group, department or company for outstanding contribution in the area of vehicle theft investigation or prevention. This year’s committee was comprised of IAATI members Barb Rambo, Bill Skinner and Denny Roske and it found itself voting on 6 great submissions. The 2012 winner of the Award of Merit is the New South Wales (Australia) Police Force for “Operation Burindi”. In May, 2010 the New South Wales Police Force began investigating a sophisticated organized criminal motor vehicle re-birthing syndicate which operated out of southwest metropolitan Sydney with impacts nationally and internationally. Shortly after, Strike Force Burindi was formally established combining the efforts of the New South Wales Police Force Property Crime Squad, State Crime Command, and Australian Customs, & Border Protection Service. The investigation continued as the strike force conducted numerous search warrants, gathering additional information on stolen vehicles, and identifying suspects. It was learned that some vehicles and vehicle parts were being shipped to Beirut, Lebanon. A search warrant was executed on a shipping container that was on a ship in Port Melbourne, Victoria. Discovered in the container were 15 tons of stolen vehicles and parts. Many stolen vehicles had been re-birthed and sold to innocent purchasers. Over the next 20 months Strike Force Burindi recovered 61 stolen vehicles with a value of over $3,000,000, arrested 6 individuals and issued 1 arrest warrant for a person who fled to Lebanon. Strike Force Burindi also illustrated the importance of liaising and combining forces with other agencies in the pursuit of organized crime syndicates. 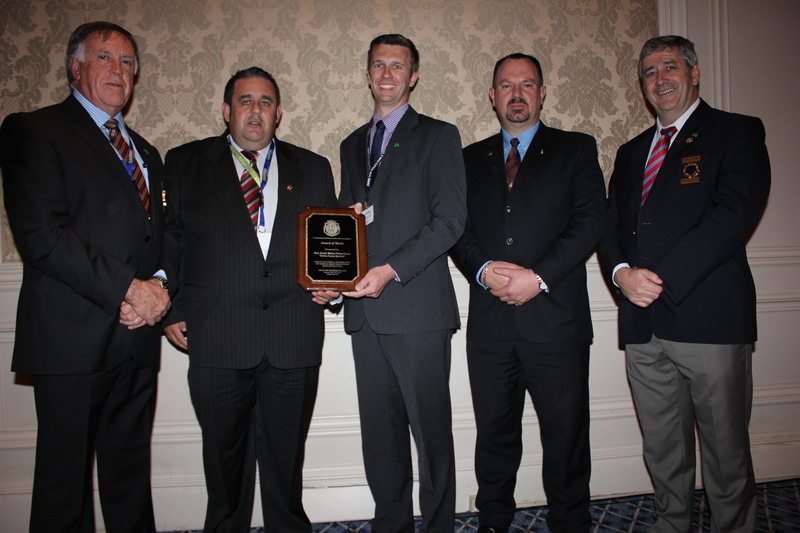 Present to accept the award at IAATI’s 60th Annual Seminar in Kansas City, Missouri were Detective Senior Constables Matthew Napper and Matthew Taylor. IAATI and the Award of Merit Committee congratulate the New South Wales Police Force on this successful investigation. They are very deserving of IAATI’s Award of Merit for 2012. IAATI President Christopher McDonold - Left - Center - NCRC President Glenn Ebersold - Right IAATI Past President and Chair of the IAATI Award of Merit Committee - Glenn accepted the Award of Merit for the Indiana State Police and Secret Service who could not attend the seminar. Det. Deron Brown (Left) - IAATI President Christopher McDonold (center) NICB Director Darrell “Rusty” Russell accepting IAATI Award of Merit. This year found the committee found themselves in a quandary with the voting on the four submissions. After many discussions, two ended in a tie. For the fi rst time in many years, the committee decided to award two winners for the award. The St. Lucie County, Florida Sheriff’s Offi ce shares the honors with the Indiana State Police and the Secret Service. Both of these winners conducted lengthy and well organized investigations. In April, 2009, the St. Lucie Co. Sheriff’s Detectives Deron Brown and Rusty Russell opened up “Operation Grab Bag”. The investigation involved the sale of stolen vehicles with fraudulent vehicle identifi cation numbers (VIN’s) used to conceal their true identity. After recovering a single stolen vehicle, common denominators revolving around a grocery store and fraudulent North Carolina and New York titles caused the Detectives to sort through 80,000 registered vehicle records to identify potential VIN switched vehicles. The list was narrowed down to 6,000. That’s when they sought the assistance of Special Agent Price of the NICB. Together along with 12 other police agencies they investigated for a year and a half. The case culminated in September, 2010 with a total of 48 VIN switched vehicles identifi ed, 30 of which have been recovered and identi- fi ed as stolen with a value of $759,345.00. Arrest warrants were issued for three individuals involved in the case. Det. Brown and Det. Russell (now a NICB Agent), were presented the award at our seminar in Atlantic City. Also winning the award was the Indiana State Police and the U S Secret Service. In May of 2009, Det. Mitch Blocher of the Indiana State Police was networking with others at an investigative meeting and was asked to look at 60 North Carolina vehicle titles. (Hey, does this sound familiar, like the above case also had North Carolina titles involved?) Within days Det. Blocher had tracked down and recovered 15 stolen cars and trucks. NICB Agents assisted Det. Blocher with the identifi cation of the vehicles. Each of these vehicles had been retagged with a counterfeit public VIN plate. Det. Blocher realized that he had multiple suspects and vehicles crossing state lines. He contacted Special Agent Danny DiRienzo of the U S Secret Service. Bloche and DiRienzo used informants, undercover sting operations, and a federal wire tap to conclude their complicated case. The end result was over 50 stolen vehicles recovered valued in excess of $2 million with fi ve individuals charged under federal indictments. Blocher and DiRienzo are still looking for 20 more possible VIN switched vehicles. Blocher and DiRienzo were unable to attend the Seminar in Atlantic City. The award was presented to Glenn Ebersold, President of the North Central Regional Chapter of IAATI. Glenn will present the award to Det. Blocher and Special Agent DiRienzo at a later time. On March 2, 2009, Detective Reid Stacy of the Dallas Police Department Auto Theft Salvage Squad received information that the occupants of 3632 Hammerly Drive were receiving, storing and dismantling stolen vehicles. bumper. Detectives were unable to verify the identity of the vehicle and on April 11, 2009, patrol recovered the vehicle approximately 4 to 5 blocks from the address in question. On April 15, 2009, Detective Stacy identified two subjects as possible occupants through a combination of database searches including adult identification system. On April 21, 2009 Detectives Stacy and Salinas conducted surveillance at the location. Detectives observed in the back yard a male subject stripping the interior of a blue 2000 Chevrolet vehicle. The vehicle was also missing front quarter panels, grill, hood and doors. Detectives were unable to identify the 2000 Chevrolet. Next to the stripped blue Chevrolet was a 2009 gray Chevrolet Silverado that was in good condition. The next day, Detectives Stacy and Ferguson conducted surveillance and observed a 2000 blue Chevrolet in the back yard of the residence. The vehicle was in good condition. Also in the backyard was a stripped vehicle that was being concealed with a plastic tarp. Detectives observed four males loading unknown parts into a 1999 white Chevrolet pickup with a Texas license plate. Again, one day later, Detective Ferguson conducted aerial surveillance with the assistance of the Dallas Police helicopter. Detective Ferguson observed two vehicles in the back yard. One unknown vehicle was covered with a plastic tarp. The vehicle was identified as a 2003 white Cadillac Escalade. On April 24, 2009, detectives from Dallas Police Department Auto Theft Salvage Unit “Junk Yard Dogs” conducted a knock and talk investigation at the location. One subject interviewed stated that he resided there. Detective Stacy asked this subject if he would grant detectives permission to search his residence and residential yard. The subject agreed by signing a written consent form. Due to the long hours and tireless effort put forth by Detective Stacy of the Dallas Police Auto Theft Unit, he was nominated and won the Award of Merit. for the 2009 Award of merit were all worthy of recognition making the final determination was a difficult task for the committee. Office, Metro Police Department and the Texas Department of Public Safety-Motor Vehicle Theft Service. • The Taiwan Crime Investigation Bureau (CIB), Represented by Mr. M.S. Huang, Director General, in conjunction with the DataDot Corporation. • The Metro Nashville Tennessee Police Department Auto Theft Unit comprised of 1 Sergeant and 8 Detectives. • Detective Corporal Steve Sunderland of the Baltimore City/County Regional Auto Theft Team. After a review of all of the information and statistical data from the nominees, including hundreds of arrests and millions of dollars in vehicle recoveries, the winner was determined to be Detective Corporate Sunderland. Under his direction, the team has focused their efforts on several major areas of vehicle theft including cargo theft, motorcycle theft and insurance fraud. These efforts have produced solid results and a 30 year low in overall vehicle thefts in the area, results that are obviously very impressive and well deserving of the award. The Award was presented at the IAATI Seminar in Westminster Colorado. Accepting the award for Detective Corporal Sunderland was Captain Don Roby who is the head of the Baltimore Property Crimes Section. excellent results and some well deserved nominations. 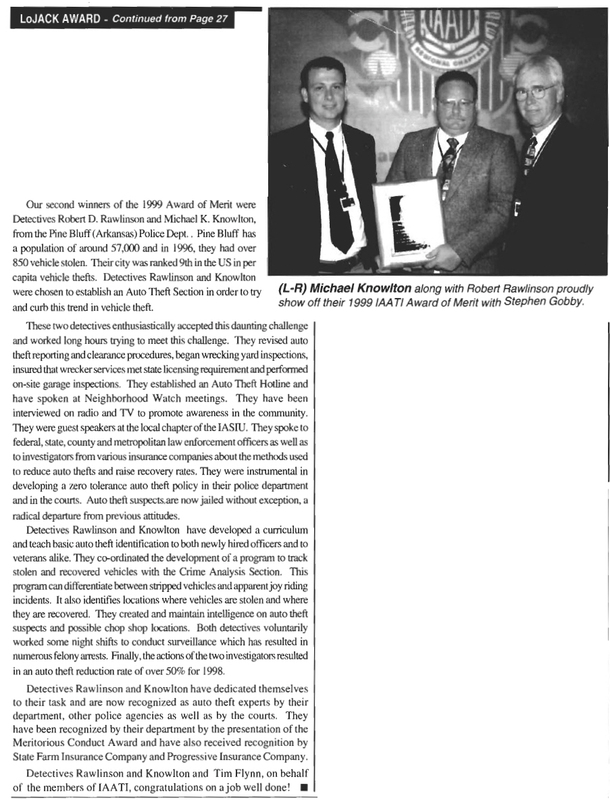 2008 IAATI AWARD OF MERIT RECIPIENTS: (L toR) Det. Charles Baker, Det. Edward Gesser, Jimmy Hester, Inv. Hallie Crance, Special Agent Jared Stahl. (Not Pictured: Trooper First Class Chris Thomas). discussing a recent auto theft case when they realized that one individual was a common element in two of their cases. They turned this conversation into a 3 ½ year multi-jurisdictional investigation. They were soon joined by Investigator Crance of the Maryland Motor Vehicle Administration, Trooper First Class Thomas of the Maryland State Police, and Detective Stahl of the University of Maryland Police Dept. developed enough information to arrest and charge all of the 14 individuals involved. During the investigation, one of the individuals involved was murdered on his car lot. The murder case is still under investigation. These investigators managed to accomplish a great deal without the benefit of a dedicated task force. In all, they were able to identify 87 stolen vehicles that were titled through fraudulent means. IAATI salutes this group for a great job with the Award of Merit. Det. Charles Baker, Charles Co. Maryland Sheriff's Dept. Det. Edward Gesser, Prince George Co. Maryland Police Dept.